The Father and Sons tandem in the 2019 elections seeks office. 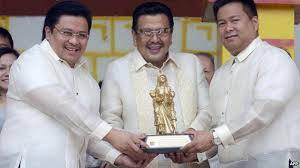 Former President and Manila Mayor Joseph Estrada announced his intention for re-election in 2019 and disclosed that his two sons JV Ejercito and Jinggoy Estrada will run for senate in the next midterm election. Mayor Estrada arrived at the school past 10 a.m. and was accompanied by his daughter, Jerika to vote for the local poll.